In the event that a client has had a different service to the one they were originally booked in for, you need to Edit the service in POS to ensure that the service is also changed on the Appointments page. You can't delete the service listed in POS, and then add back a new one, because the one on the appointments page won't be paid for. 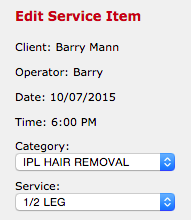 How to change a clients service in POS the right way. Add the client to the sale and click the row the service displays in. On the right side panel, change the service via the Category and Service dropdown menus. Once you've picked the service, which the client actually had done, click Save. The service will be update in POS. Receive Payment, choose payment type and Finish Sale as per normal. This process changes the service on the appointment page as well. This is the correct way of changing the clients service if they had something different to what they were originally booked in for. If you have any questions, please send them to us via the Submit a Request option in your Help & Support page ?we're here to help.